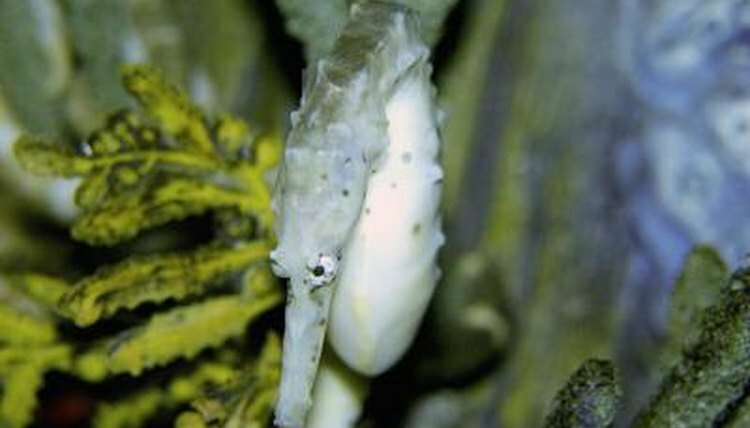 Dwarf seahorses generally adapt well to life in the home aquarium. The one major caveat is that they require specialized, complicated feeding -- above and beyond that of most aquarium fish, even other seahorses. These obstacles are not insurmountable, but they require dedication. In the wild, dwarf seahorses constantly dine on small crustaceans called copepods. Dwarf seahorses have very simple digestive tracts, so they eat constantly to get enough nutrition to survive. They capture prey by sucking it up with their protruding snouts. Unlike some larger seahorses, their predatory instincts are so ingrained that, in the home aquarium, they almost never learn to accept anything but live, moving food. You can feed your captive seahorses copepods in captivity. Certain high-end pet shops sell them, and you can purchase cultures on the Internet. However, brine shrimp are easier to culture at home, and dwarf seahorses readily accept them. Some experts have expressed concerns about the nutritional value of brine shrimp, though many people have raised multiple generations of dwarf seahorses on this diet. You can soak freshly hatched brine shrimp in nutritional supplements to improve their nutritional value. One way to ensure that dwarf seahorses always have food is to assemble a refugium for your aquarium. A refugium consists of a box that contains a breeding population of organisms that drain or overflow into the aquarium. Refugiums typically contain seaweed and rocky rubble. You can add copepods to the refugium. They will multiply, and some will wash into the main aquarium. You can also include nerite snails in the refugium and the main tank. These snails produce free-swimming larva called veligers. These are perfectly sized for dwarf seahorse snacks. Even if you set up a refugium, you will still need to feed your seahorses, and frequently. You should feed seahorses at least twice a day. You should feed enough brine shrimp, or copepods if you went that route, that it looks like a light snowstorm -- but not a full-on blizzard -- in the aquarium. Dwarf seahorses will learn the currents in their tank and pick perches to sit on while they wait for food to pass by. How Does an Automatic Fish Feeder Work?